Motorcycle season is here and we are teaming up with the Rochester Chapter of The Distinguished Gentleman’s Ride (ROC DGR) to invite you, your friends, all bike lovers, and all art lovers to join us for a free evening on the MAG grounds where we look at motorcycles as functional art. 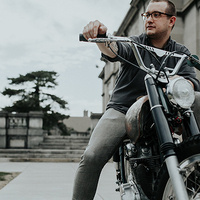 See some of Rochester’s coolest custom bikes, learn about our outdoor sculpture, visit the museum for half-price, and enjoy food and drinks for purchase from Brown Hound Downtown. ROC DGR will kick off its 2018 efforts with some major announcements at this event! Photo: Gabrianna Dacko Photography. Talent: Rich Odlum.